Infinite Art Tournament: Element of the Month: Einsteinium! Boiling Point: Nobody knows. There's never been enough to fill a kettle. Friends, we can no longer continue our tour of the elements without attending to an unseemly reality: some of the elements are totally fake. This is to say, they don't exist in the natural world. They wouldn't exist at all, in fact, except that uppity theoretical physicists thought very very hard about what they would be like if they DID exist and then devoted their careers to what is called "fundamental science," which is to say writing grants. These grants allowed the physicists and their slave armies of graduate students to devise very expensive and clever apparati that, once built, conjured these fake elements into reality. So whereas elements like "Hydrogen" (1) and "Oxygen" (8) and "Sodium" (11) are really and truly the building blocks of all matter as we experience it in the real world, elements like "Darmstadtium" (110), "Dubnium" (105), and "Roentgenium" (111) are far more important as ideas than for any actual presence in the universe. Trippy. Einsteinium, which is of course named after the great musicologist Alfred Einstein (who, among his many other achievements, edited the Köchel catalogue of Mozart's works), sits at the cusp of reality and theoretical physics. It didn't exist -- or, certainly, didn't exist here in the Sol family of planets where the L&TM5K is produced -- until the middle of the 20th Century. But then, during the 1950s, several major countries felt it was a good idea to set off lots of powerful atomic bombs in order to demonstrate to other countries that they had lots of powerful atomic bombs, and since they were doing this anyway they figured they would allow their brainy theoretical physicists types to get in on the action. And so it was that brainy theoretical physicist types from the Pac-10 college football conference were able to sift through the fallout of the quaintly named "Ivy Mike" nuclear blast -- and when they did they were all like "OMG we've got a whole new element here! Two hundred atoms of it!" Except that they weren't actually allowed to text their friends, because the existence of a new fundamental form of matter would, in the spirit of universal brotherhood and progress, be treated as a military secret for the next three years. This image purports to show around 300 micrograms of Einsteinium. 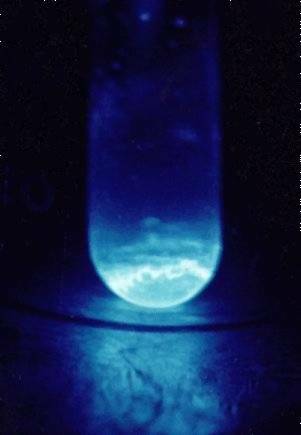 The blue light is caused by "the intense radiation produced by einsteinium, primarily in the form of alpha decay." Which is to say, what you can see of Einsteinium is its self-destruction into something other than Einsteinium. You call that "elemental"? 'Cause I don't. Now, in these little write-ups I usually look into what an element looks like, how it's used in the human community, and so on, but in the case of Einsteinium why would I even bother? Production of the stuff worldwide is by all accounts just a fraction of a gram a year, too little for it to really look like anything, and its only use is to be studied by brainy theoretical physicist types (sometimes to be used as a stepping stone in the creation of even more fakey elements). And don't be fooled: Einsteinium is a totally fakey element. The whole idea of an element, after all, is that it is one of the irreducable forms -- the "elements," if you will -- of matter. And Einsteinium ain't anything like irreducable. In its most stable form, it has a half-life of less than 500 days. This is to say, it has an inherent and relentless characteristic of shedding its subatomic particles and turning itself into moderately less fakey elements, such as Berkelium and Californium. So if you ever get your hands on some Einsteinium, remember that it's best fresh. Use it as quickly as you can, or at least as quickly as is compatible with getting treatment for radiation sickness. Oh, by the way, Einsteinium was actually named after Albert Einstein the physicist, not Alfred Einstein the musicologist. That bit was just me having you on. "what is called "fundamental science," which is to say writing grants." Mr. 5K, you are an amusing goof indeed. Thanks for this, all this time I thought it was named after Albert Einstein the famous comedian, actor, and writer. Owl: I am! You can see that Rebel was HIGHLY amused by my antics. dhk: Huh, I didn't know about the other Albert Einstein. Interestin'.